Learn right-angle weave (RAW) - an off-loom bead-weaving technique - while making a bracelet that mimics the look of a classic tennis bracelet. 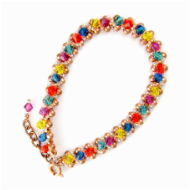 You'll first create a RAW base of metal beads and then embellish it with crystals and tiny seed beads. You should be able to finish the bracelet during our lesson. However, if you don't; I'll make sure you know how to attach the clasp before you leave. These are the minimum quantities you'll need to complete a RAW tennis bracelet that is about 7 to 7-1/2 inches long and 1/4 inches wide. My Supply Kits contain the largest number of the items listed below. ​Color Ideas: You can be very traditional in your colors using gem-toned crystals with silver- or gold-plated beads; or go a little wild like a mix of colors and copper beads. I'll have Supply Kits in several color combinations. These are the tools you'll use in class. If you don't have them; I have ones you can use.